This fantastic championship card featured six matches. In the first match, Chief Billy White Wolf took a one fall match from Rocky Montero. 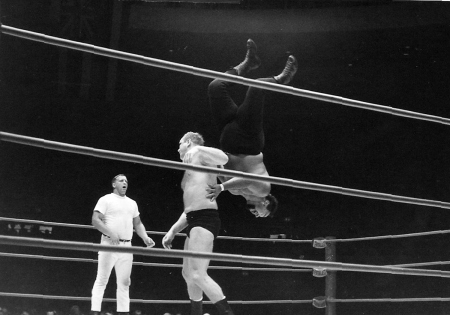 Ripper Collins and Killer Buddy Austin won two out of three falls from Nick Bockwinkel and Dory Dixon in the next match. John Tolos drew with The Missing Link. Kurt and Karl Von Steiger won over the team of Bobby and Jerry Christy. Nick Bockwinkel works on Buddy Austin's leg. Dory Dixon and Ripper Collins(right) watch from their corners. 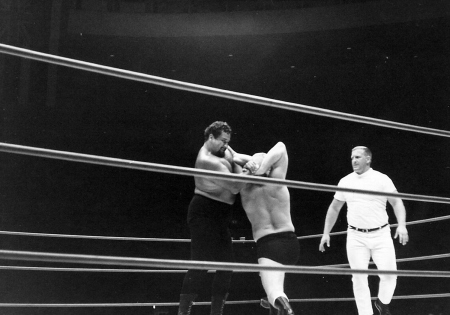 The first main event was for the Worlds Heavyweight Championship. 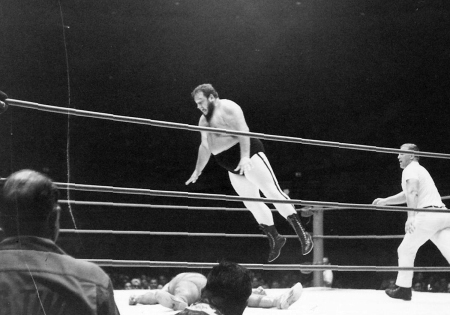 Dory Funk Jr., the new champion, recently dethroned former champion Gene Kiniski in Florida. 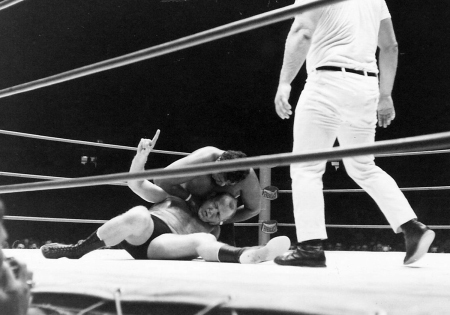 Funk was making his first title defense in Hawaii against Hawaiian Heavyweight Champion Curtis Iaukea. The referee for this match was wrestler Rocky Hunter. The first fall came in 22:30 when Funk applied his Spinning Toe Hold on Iaukea, who quickly submitted. In the second fall, Iaukea threw Funk into the turnbuckle and he fell forward and his head went into the steel post and gave Iaukea the opportunity to drag him into the middle of the ring and gave Funk a Big Splash to win the second fall in 14:07. Iaukea uses arm bar on Funk. Both men struggled viciously for the remainder of the hour. Time ran out, the bell rang, there was no winner, and the match was declared a draw. Dory Funk thus retained his title. The other main event of the night was for the North American Heavyweight Championship. 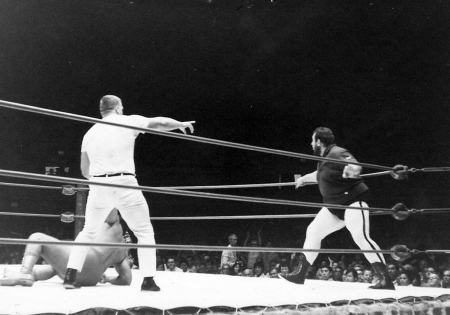 Pedro Morales, the champion, met his mortal enemy Gorilla Monsoon. The referee again was Rocky Hunter. When both wrestlers entered the ring, Monsoon attacked Morales and started kicking him. Hunter tried to break it up and Monsoon threw him to the mat. When Hunter tried to get up, Monsoon again knocked him down. Hunter had the bell rung and awarded the first fall to Morales on a disqualification. 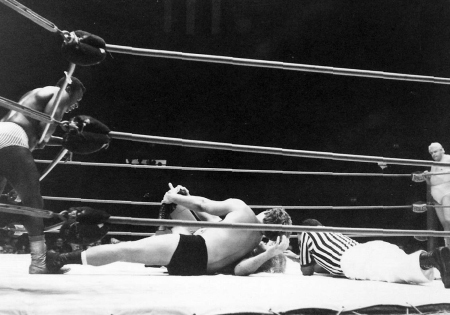 Monsoon reacts after being disqualified by referee Rocky Hunter for the 1st fall. Gorilla Monsoon won the second fall with a Big Splash in 1:47. Monsoon splashed Morales to win the 2nd fall. Referee Hunter starts the count on both wrestlers as they lay on the mat. 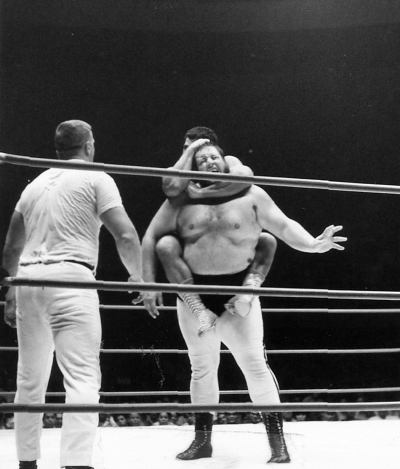 Morales applies the sleeper hold on Monsoon to win the match. 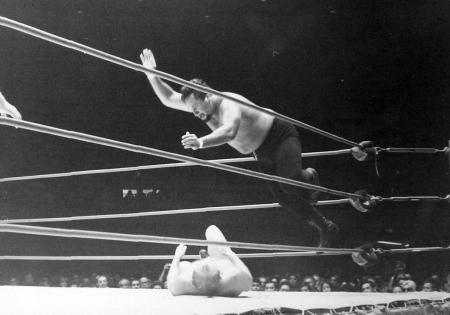 Monsoon kicked Morales at the beginning of the third fall and wouldn't let him get up. Morales finally got up and got the sleeper hold on Monsoon but Monsoon fell back into the turnbuckle and knocked Morales out. 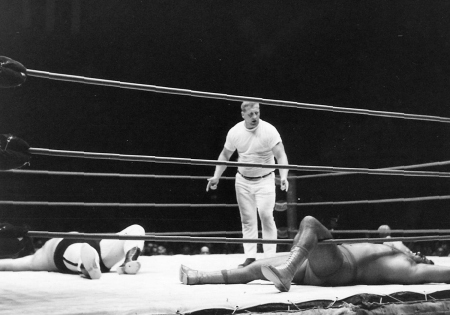 Both men were lying in the middle of the ring. Morales got up first and applied the sleeper hold on Monsoon again in the middle of the ring leaving Monsoon defenseless. Monsoon fell to his knees, referee Hunter lifted and dropped Monsoon's arm and he was out cold. The match was over and Morales retained his title in 11:20. Ed Francis ran into the ring to congratulate Morales as Monsoon lay asleep in the middle of the ring.